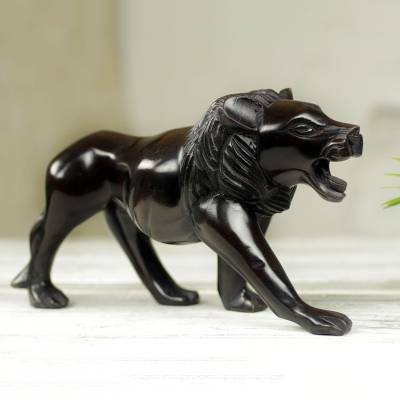 Mighty African Lion Hand Carved Ebony Wood Sculpture, "Lion Prowl"
This mighty lion commands respect and admiration. From Agnes Amponsah, the ebony wood sculpture is carved by hand with vivid artistry. Agnes Amponsah has received a $200 microcredit loan with 0% interest. "I'm inspired by my children, who push me to work harder, and seeing them succeed in life is my greatest desire." "My name is Agnes Amponsah and I was born in Eastern Ghana in 1947. My friends say I'm fair, honest and respectful. "Since 1996, I've been a wood carver. I was taught at the art center in Accra and have passed on my lessons to others. My involvement in this art is a family inheritance. My sister had a workshop, which I took over after she died. "My sister's workshop always reminded me of her, so I eventually started on my own in a humble venture. With time and hard work, I was able to expand my workshop. "I love seeing how attractive and portable my carvings can be. My most difficult moment in life was when I had to go to Mankesim in Central Ghana but I was in a car accident that hurt my leg and left me needing a walking stick.